How Many Calories Are in a Pizza Hut Personal Pan Pizza? Pizza Hut serves two sizes of personal pan pizzas: the 6-inch traditional size and the 9-inch PANormous pizza. They offer numerous variations of these personal pizzas for both veggie and meat lovers alike. A cheese only 6-inch personal pan pizza contains 590 calories, including 210 fat calories. The Veggie Lover's personal pan is 550 calories with 180 calories from fat. Add pepperoni to the 6-inch cheese personal pan pizza and you consume 610 calories with 240 coming from fat. The Meat Lover’s personal pan contains 830 calories, including 410 fat calories, while the triple meat Italiano has 730 calories with 330 of those calories from fat. If you opt for the ham & pineapple personal pan pizza, you'll consume 550 calories with 180 calories from fat. 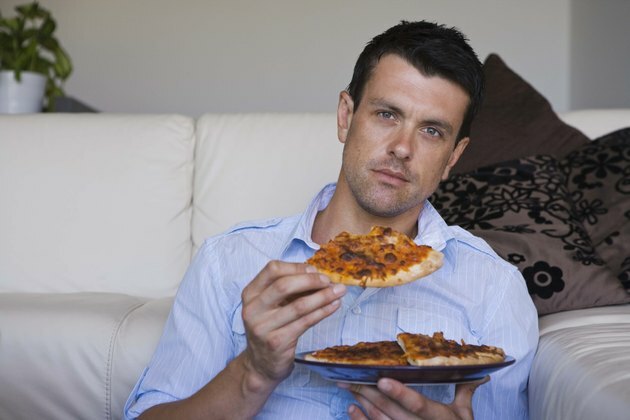 The 9-inch cheese personal PANormous pizza contains 1100 calories with 410 calories from fat. The Veggie Lover's version of this pizza is 1010 calories with 340 calories from fat. Add pepperoni to the cheese personal PANormous pizza and you'll get 1100 calories with 430 coming from fat. The Meat Lover’s personal PANormous pizza has 1460 calories, including 710 fat calories, while the triple meat Italiano version provides 1280 calories with 560 of those calories coming from fat. If you opt for the ham & pineapple personal PANormous pizza, you'll consume 1020 calories with 330 calories from fat.